Trump gives a speech at Myrtle Beach , SC, with Melania, and his family, the first time Melania has been seen on the campaign trail. He criticizes Obama. Look at our inner cities…I call him [Obama] the great divider. I am going to be a unifier. Trump also calls on Americans to take action and report suspicious activity in their neighborhoods. The real greatest resource is all of you, because you have all those eyes and you see what’s happening. People move into a house a block down the road, you know who’s going in. You can see and you report them to the local police. You’re pretty smart, right? We know if there’s something going, report ’em. Most likely you’ll be wrong, but that’s OK. But let the local police go in and check out and you get rid of this stuff. That’s the best way. Everybody’s their own cop in a way, you gotta do it. You gotta do it. This is what I call a real supporter, Wow! Are you married? [To wife] Are you happy with your husband? She said yes! She fantasizes that he’s really the real Donald Trump. I’ve gone through tremendous amounts of everything, deals and building companies and taking care of people. It hurts a marriage because you’re working all the time… what I did is I worked so hard that I think it was a very, very hard thing for somebody to compete with. We have great chemistry. To be with a man as my husband is—you need to know who you are… you need to have a very independent life as well and supporting him, you need to be very smart and quick, and be there for him when he needs you. Trump appears on the cover of People magazine’s October 12 issue. 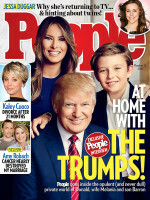 Inside, in a feature called At Home with Donald Trump, he talks about his family. I just don’t have the time that I would love to spend with my children and my wife. I see less of my grandchildren than I might like. But they get how important this is…It’s a little scary for Barron. He thinks he is going to be taken away from friends. But I tell him if this happens, Daddy will help people, and can help children like him, and that makes him happy…My life is so busy and so crazy, and I’m away all the time. If I can just stay home and do nothing, it’s considered a great luxury. My husband is traveling all the time. Barron needs somebody as a parent, so I am with him all the time…He is who he is. Even if you give him advice, he will maybe take it in, but then he will do it the way he wants to do it. You cannot change a person. Let them be. Let them be the way they are…It’s a long road. I take it day by day. My husband has a lot of people cheering for him. We will see. Trump and Knauss get married in front of 350 guests at Bethesda-by-the-Sea Episcopal Church, on the island of Palm Beach, Florida, followed by a reception at Trump’s Mar-a-Lago estate. Knaus wears $150,000 of diamonds. Rudy and Judy Giuliani, Hillary and Bill Clinton, P. Diddy, Katie Couric, Heidi Klum, and Gov. George and Libby Pataki are among the guests.